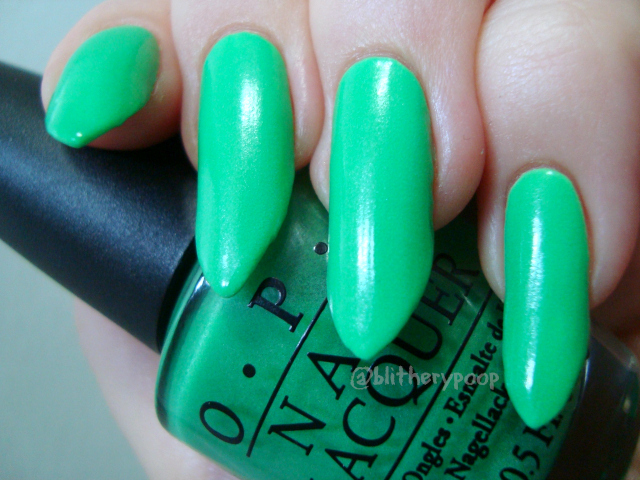 OPI Don't Talk Bach To Me is a pale yellow-green with a slightly pearly finish. 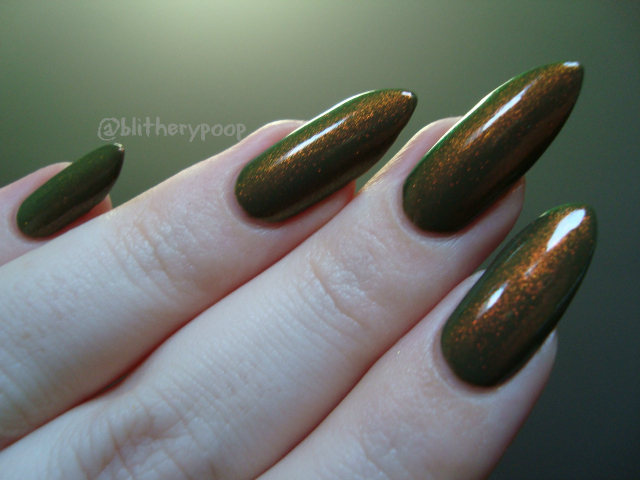 When OPI's Germany collection came out a couple of years ago, I haaaated this shade. You couldn't have paid me to wear it. Then I had my ugly green epiphany because of Sinful Colors Innocent and for about a year I hmmmm'ed over DTBtM every time I saw it. I wound up getting it this spring when I exchanged another shade I'd accidentally bought twice. Finally dragged it out today and I like it! Not love, just like, because it lobsters me out a bit...but it's enjoyably phlegmy and the finish is a slightly stronger version of hint of pearl in Amazon...Amazoff. This is three coats. 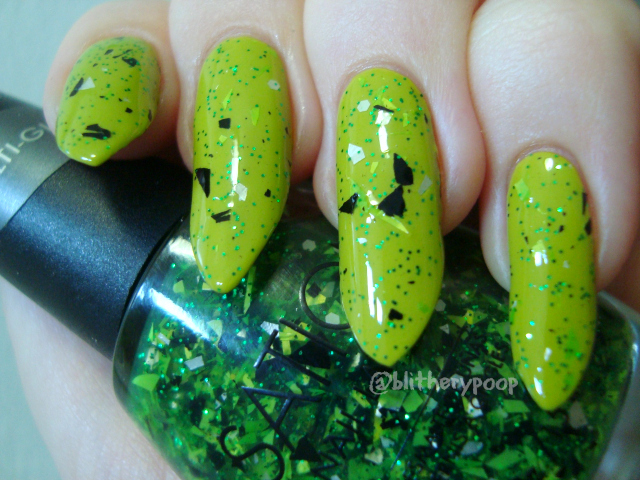 China Glaze Trendsetter is a murky yellow-green with gold microfleck shimmer. Another shade I used to hate...but I love it now! I think knowing that Nichole, my mom, and others probably find it revolting helps. I'm a bratty little kid at heart, after all. Bat My Eyes is cool too. The sparse bar glitter in it originally kept me away, but it's almost non-existent. This is two coats of Trendsetter with three coats of Bat My Eyes as an accent. Color Mates Waikiki Kiwi is a chartreuse cream. I topped it with Sation Ego-Friendly. A Dollar Tree find and 'one that got away'... I had a bottle of Ego-Friendly in my hand at Marshalls forever ago and stupidly put it down. It wasn't there when I came back a few days later and I never saw another bottle. I wound up having to buy it online. Grrr. Waikiki Kiwi was a bit hard to apply. I needed three coats for evenness. Ego-Friendly is fussy too, but for another reason. The glitter settles almost instantly. It's easy to apply once it's mixed back into suspension, but I've rarely seen glitter sink so quickly. 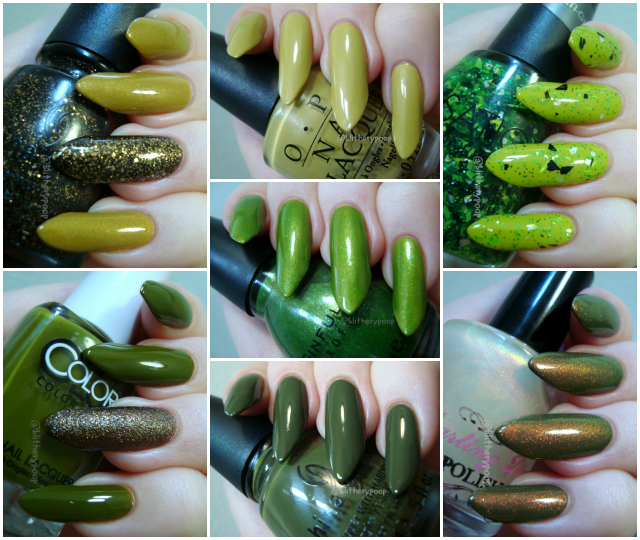 Sinful Colors Show Me The Way is a sheer olive green with blue microfleck shimmer. 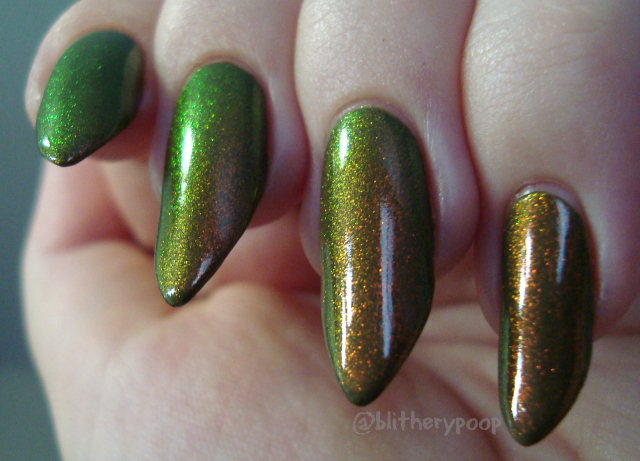 I'll probably swatch this one again sometime, since the base changed the look considerably. On its own it's probably a 4-ish coater and I didn't have the time today. This is two coats over Don't Talk Bach To Me. Color Club Tribe And True is an avocado green crelly. accent is OPI What Wizardry Is This? I wanted this one so bad!! When it finally turned up at the nail supply over the summer I almost shouted. Now that I've swatched it...I adore it! It's my new favorite green. This is three coats, with three coats of OPI What Wizardry Is This? as an accent. 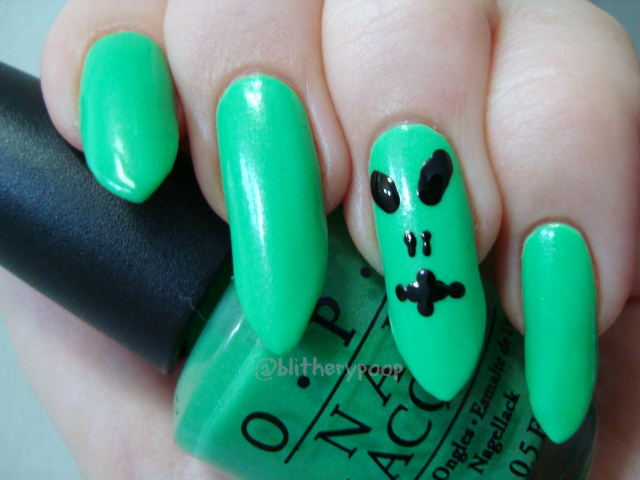 OPI Zom-body To Love is a light green that glows in the dark. This one kept turning up when I searched for a reasonably priced bottle of Glow-Ink In The Dark. Eventually I got both from the same Storenvy seller. Woo! 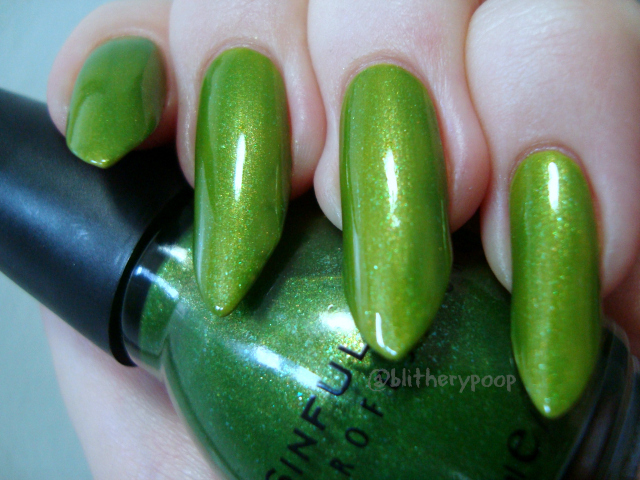 When I swatched You Are So Outta Lime last month, I knew I'd be wearing it again as the base for Zom-body. They're so right together! This is two coats of Zom-body, over two of YASOL, over white. I decided not to top coat it, for maximum glow power. The finish is kinda cool as-is too. So how's the glow? Fierce! 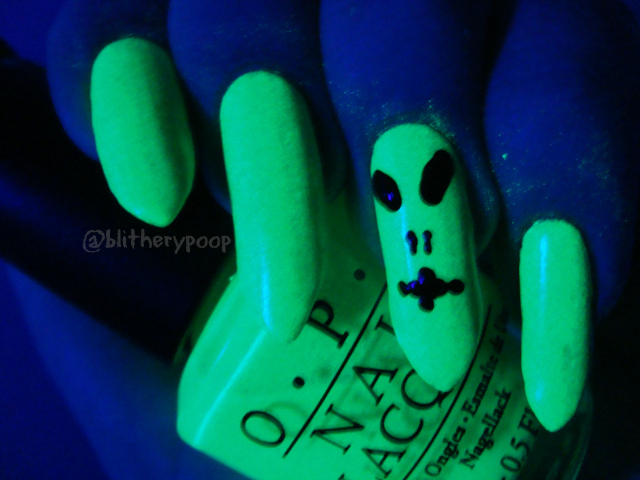 I could -almost- get a photo of it without the blacklight, it's that bright. With the blacklight it's blinding! The glow photo for this turned out even better....but shows how impossible this is to clean up! The little glow particles are invisible on the skin until they're in the UV light. I love it anyway! As if this post wasn't long enough already, I have a few more swatches from earlier in the month that never made it into their own post. 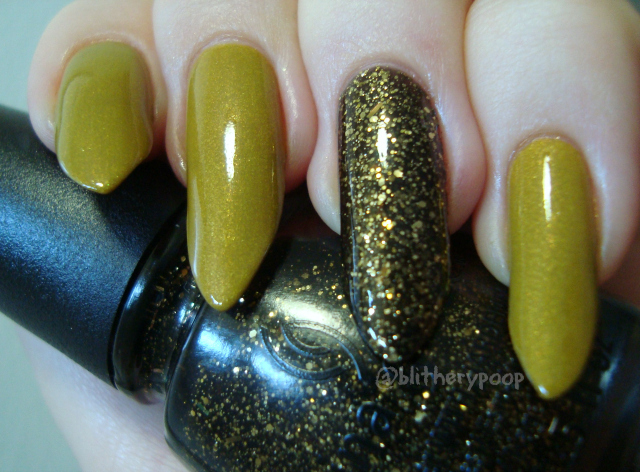 China Glaze Westside Warrior is a toned-down olive green cream. I wore this to one of my many MANY recent dentist appointments and the tech was in awe of my nails. So there, Nichole! Ugly greens FOREVER!! This is two coats. 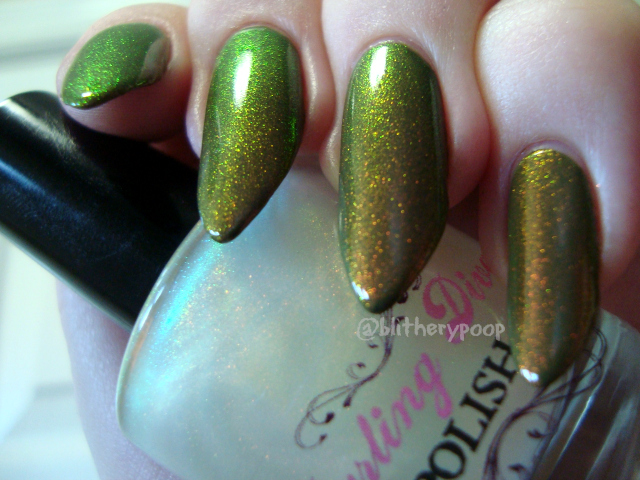 Darling Diva Ringer Goes Blonde is a red/yellow/green multichrome shimmer topper in a clear base. Nothing ugly here, just an awesome topper. This is two coats over Westside Warrior. The shift is outstanding! Drool and gasp...and sputter and...just...sigh happily. So...where do you stand on ugly greens? Ugly greens are my happy place in polish land ! I love pretty much all greens and these are no exception. 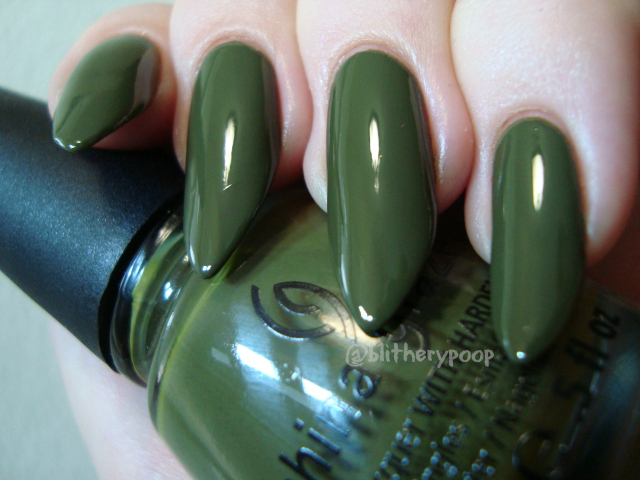 Olive is actually one of my favorite colors to wear because it always looks amazing with my coloring and makes my skin look awesome. Obviously, I do not have much pink or red in my skin, haha.